Disease and illness in the 19th century were not fully understood even by the medical profession, and so every household had their own mixtures and home remedies for every form of bad health. Many entrepreneurs, many with no medical training, advertised medicines that could ‘cure all’. 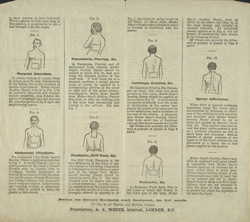 This leaflet features a plaster that when applied to the body was a cheap and effective way of curing a range of ills from headaches and pneumonia to lumbago and sciaticia.